-Recommended for audiences up to 500 - 24-speaker articulated line array delivers 180-degree horizontal sound coverage -Produces the most consistent tonal balance with little volume drop-off over distance -System's interconnecting pieces allow for efficient transport, easy setup and breakdown -Four-channel ToneMatch audio engine with studio class effects -One B2 bass module included Boost your performance with the L1 Model II system, our most advanced portable amplification system for musicians, DJs and public speakers. The loudspeaker delivers 180 degrees of horizontal sound coverage and our smoothest tonal balance -across the stage and throughout the room. And the ToneMatch audio engine provides a suite of studio-class effects and tone-shaping tools to give you just the sound you're looking for. Includes one B2 bass module for more flexibility and even greater power at the low end. 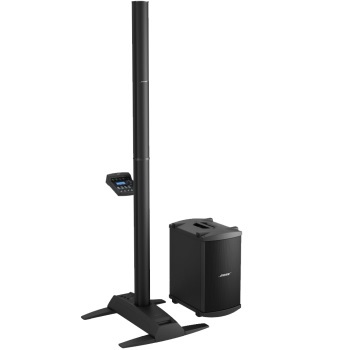 Our best portable sound system for musicians combines the Bose L1 Model II system and T1 ToneMatch audio engine. This professional concert sound system provides wide coverage, smooth tonal balance and a suite of studio-class effects and tone-shaping tools. And it's packed with proprietary Bose technologies designed to improve your amplified sound.